Diamond Jubilee of AIIEA is being celebrated across the country with great enthusiasm. We extend warm and revolutionary greetings to all insurance employees on this occasion. The glorious history of AIIEA is punctuated with saga of struggles and sacrifices coupled with success and progress. For the last sixty years, the AIIEA has been built brick by brick with the selfless sacrifices of legendary leaders, committed cadres and members. In its long and arduous journey, the AIIEA faced stiff challenges from time to time. It could overcome all these challenges by assessing the situation and employing correct tactics in struggle. “UNITY IS OUR STRENGTH” has been the slogan through which the AIIEA galvanized the employees to rally round and wage bitter struggles to protect the interests of public sector insurance Industry. While doing so, it also constantly strived to improve the service conditions of the insurance employees within the industry. The success story of the AIIEA is so phenomenal that today the insurance employees across the country adore it for its extradinary accomplishments. In these sixty years, the AIIEA succeeded in improving the living and working conditions of the employees. The AIIEA was never sectarian in its approach. It sensitized the employees about the plight of the other sections of the working class specially those belonging to the unorganised sector. Today, when the insurance employees are celebrating the achievements, the organisation has to confront many new challenges. But the two most important tasks today are to preserve the unity of the employees and protect the industry from the onslaught of the neo-liberal state. The unity of the working class is under strain from the politics of identity. The ruling classes are cleverly using the politics of identity to divide the working class and weaken their challenge to the neo-liberal state. The immediate need is to preserve and cement this unity with the trade union movement placing an agenda of struggle against all forms of social oppression. The second important task is the protection of the public sector insurance industry. The epic struggle of the AIIEA has stalled the government’s attempts to privatize the public sector insurance industry for nearly two decades now. This struggle has to be strengthened and widened in the background of the government moves to push through the two legislations – Insurance Laws (Amendment) Bill 2008 and LIC Act (Amendment) Bill 2009. The liberalisation of financial sector has dangerous consequences. It gives primacy to finance capital over the state. Therefore, it has to be resisted. Comrades, today when we are celebrating the Diamond jubilee of AIIEA, we are confronted with newer challenges within and outside the industry. The International Finance Capital is working full time to dismantle the most successful public sector insurance industry both life and non-life. They are tremendously pressurizing the Indian ruling class to further liberalize the insurance sector by increasing the FDI cap from present 26% to 49%. The developments of the recently held INDO-US economic summit are clear indicators in this direction. There are also attempts to increase the capital of LIC from present 5 Crores to 100 Crores and to withdraw the sovereign guarantee of the Government to policies of LIC. The two bills that are introduced in the Parliament are the real challenges and the indications emanating from various sources indicates that the government is under pressure to push through these bills early paving way for further liberalization of insurance sector. The bills to further liberalize the financial sector are already introduced in Parliament. The passage of all these bills will be an attack on Banking, Insurance and Pension sectors which in other words means an attack on the people’s hard earned savings. On the other hand, the rampant corruption that is obtaining in the public and political sphere has the potential to threaten the democratic structure of the society. The Government is doing precious little to contain it. The concept of identity politics that is threatening to divide the unity of the people in the name of caste, religion, region and language is another major challenge before the trade union movement, insurance employees included. We need to face these challenges effectively and defeat them squarely. This is the Pledge we all should take on this joyous occasion. The Diamond Jubilee is a proud, yet a solemn occasion. 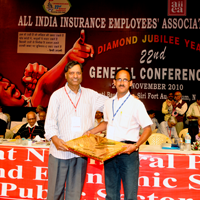 The achievements of the AIIEA in the last six decades have made every insurance employee proud. On this proud occasion let us rededicate ourselves to the lofty ideals of the AIIEA and take our beloved organisation to still greater heights. 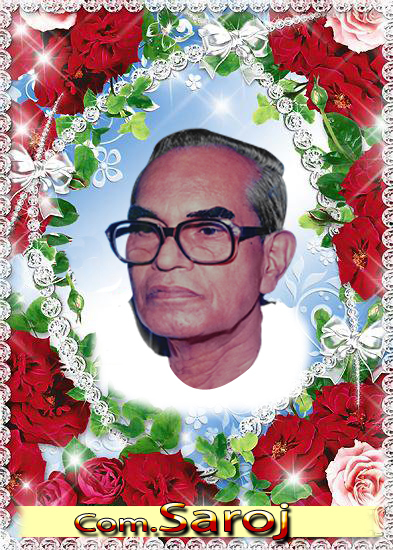 We once again extend our warm and revolutionary greetings to all of you and your family members on this occasion. Let us pledge to strengthen AIIEA on all counts so that it further becomes vibrant and a live organization. Let us strive to enhance the ideological consciousness among employees, work towards qualitative and quantitative growth and develop cadres so that the organization becomes more militant to face the challenges of time. This should be our Diamond Jubilee pledge and task. We shall in loyalty and in allegiance cherish the AIIEA, protect is as an apple of our eye and nurse it and nurture it, for the AIIEA has stood us in good stead in the past, so it will be in future too. AIIEA believes that at the end of the road lies our cherished society where the kids would not beg to stuff their stomachs, the woman would not sell their bodies, the father would not desert his children and where the horizon of life would be painted with rainbows and where the children will laugh and play, the men will work, the women will hum and the life will be like the petals of morning rose with wet dews glittering in the first rays of the raising sun.!!! OUR UNITY – OUR STRENTHE!!! LONG LIVE DIAMOND JUBILEE OF AIIEA!!! I feel proud to be associated with aiiea group. Its history is too long and the sacrifice of leaders are hard to print .Its only the dedication and spirit of leaders and members that we are celebrating its diamond jubliee . I wish to congrats comrade Gee Vee ji for their so much creative and informative work. the photos of Comrades Sunil, Saroj & Manchandha. My blog is a asset of AIIEA. Thank you comrade for your effort. Long Live AIIEA.